As part of the upcoming Say Yes! A Tribute to Elliott Smith, American Laundromat Records is letting us check out Tanya Donelly's cover of "Between the Bars." Having Tanya Donelly (Belly, The Breeders, Throwing Muses) take on any of Elliott Smith's songs is like a dream come true to me. Her version of "Between the Bars" stays perfectly true to the original, except even though there is barely any instrumentation on her version, the original just comes across as even more heartbreakingly sparse. I'm not sure if it's something in the production, or it's just the magic of Elliott Smith. It's a beautiful tribute, perfect for fans of Tanya or Elliott, or just anyone with a soul. 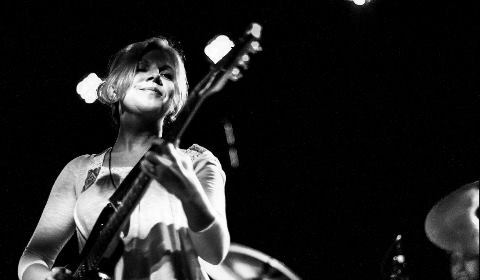 You can listen to Tanya Donelly's cover of "Between the Bars" below. Say Yes! A Tribute to Elliott Smith will be out on October 14 via American Laundromat Records. It will also feature covers by Amanda Palmer, J Mascis, Juliana Hatfield, Yuck, Lou Barlow, and more. You can find more information here. For more on Tanya Donelly's goings on, check out her website.